In a reciprocating engine the piston moves to and fro motion in the cylinder. When the piston moves upper direction in the cylinder, a point at which the piston comes to rest or change its direction known as top dead center. It is situated at top end of cylinder. When the piston moves in downward direction, a point at which the piston come to rest or change its direction known as bottom dead center. It is situated in bottom side of cylinder. The maximum distance travel by the piston in single direction is known as stroke. It is the distance between top dead center and bottom dead center. The inner diameter of cylinder known as bore of cylinder. It is the volume of cylinder when the piston is at bottom dead center. Generally, it is measure in centimeter cube (c.c.). It is the volume of cylinder when the piston is at top dead center. It is the volume which swept by the piston. The difference between total volume and clearance volume is known as swept volume. The ratio of maximum volume to minimum volume of cylinder is known as the compression ratio. It is 8 to 12 for spark ignition engine and 12 to 24 for compression ignition engine. It is the time interval between the ignition start (spark plug start in S.I. engine and inject fuel in C.I. engine) and the actual combustion starts. 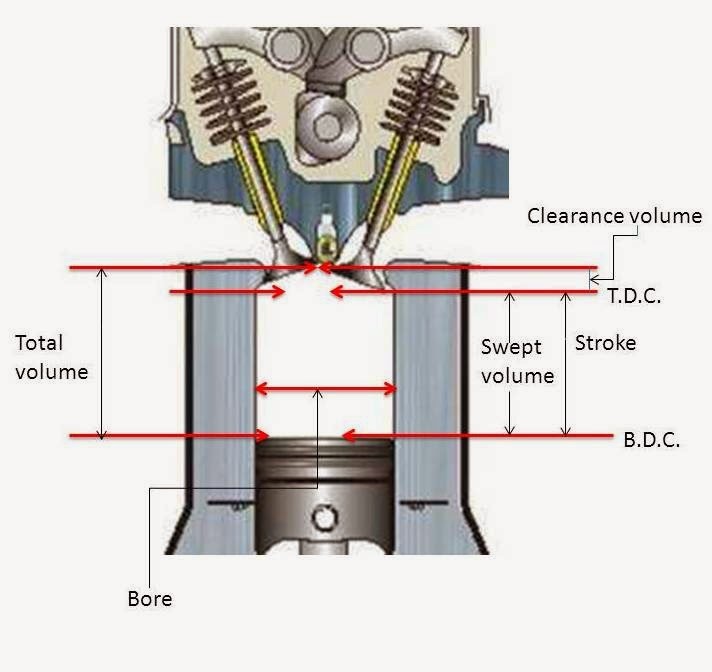 Stroke bore ratio is the ratio of bore (diameter of cylinder) to length of stroke. It is generally equal to one for small engine and less than one for large engine. The average pressure acting upon the piston is known as mean effective pressure. It is given by the ratio of the work done by the engine to the total volume of engine. Today we have Engine Terminology. If you have any query regarding this article, ask by commenting. If you like this article, don’t forget to share it on social networks. Subscribe our website for more informative article. Thanks for reading it.